One of my fondest taste memories from my childhood was a bread we used to call “Anzogna bread” (the name, I am told, is a dialect word for lard). My grandparents would buy it at a local bakery in the Italian neighborhood they lived in. These days, sadly, it’s very hard to find. Italian bakeries prefer to sell “prosciutto bread”, which I guess they feel it fancier and more marketable. Too bad it is nowhere near as delicious. Later in life I realized that it was a relation, perhaps not so distant, of a Neapolitan bread made with lard and pork cracklings called tortano con i cicoli, and belonged to a family of lard-enriched donut-shaped breads common to Neapolitan cuisine. 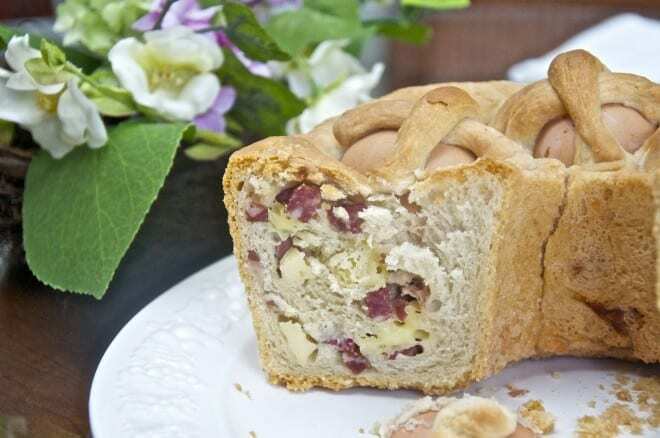 Perhaps the most famous is casatiello, a Neapolitan Easter bread, which is distinguished from its ‘sisters’ by the eggs embedded on top and topped with crosses made from dough. Casatiello is stuffed with an assortment of cured pork and cheeses (the particular mix varies from recipe to recipe) and baked until golden brown in the oven. Served as an antipasto for Easter dinner, the leftovers taste ever better eaten the next day, as part of the traditional Easter Monday picnic. 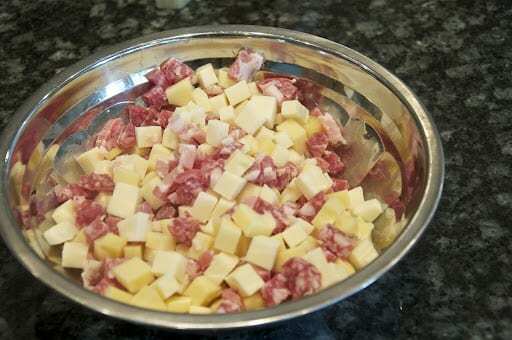 While the dough is rising, cut up your meats and cheeses into small cubes and mix everything up in a bowl. Set aside until needed. Now take the filling and spread it out evenly all over the top of the dough. Now take the dough and place it gently into a large ring mold, bring the ends around and pinching them together. Cover the mold with a towel and let the dough rise again for another two hours or so, until it has doubled again. 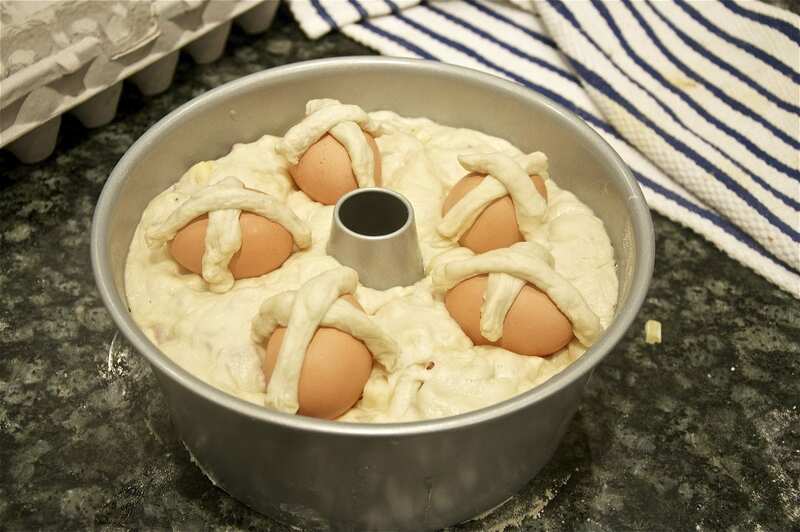 Now nestle the eggs into the top of the dough ring at even intervals. Take the dough you have set aside and form it into ten thin strips. Use these strips to make crosses on top of the eggs. Preheat the oven to 180C/375F. When the oven is hot, place the mold into the oven and bake for about an hour, perhaps a bit more, until the top is nice and golden brown. (You can raise the temperature a bit, to 200C/400F, towards the end if you find it is not browning enough. Take the mold out of the oven, unmold your casatiello and let it cool on a baking rack. Serve it lukewarm or at room temperature. As mentioned, the filling mixture for this Easter bread varies from recipe to recipe and it is said that every family has its own favorite mix of salumi and cheeses, but Neapolitan salami features in every recipe I’ve seen, as does either provola or caciocavallo, very typical Neapolitan cheeses. The doyenne of Neapolitan cooking, Jeanne Caròla Francesconi, calls for ‘svizzero’ (Swiss cheese), provolone, smoke provola, salami and soft cheese wedges (!) You can use the cheeses you like most, but they should be semi-hard variety. Grated hard cheeses like pecorino can also be used. And besides salami, pancetta is a common component in the mix. 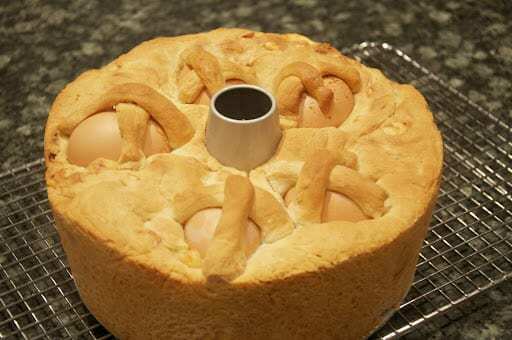 Some folks like to add chopped hard-boiled egg, sometimes omitting the egg topping—in which case you have a tortano rather than a casatiello. 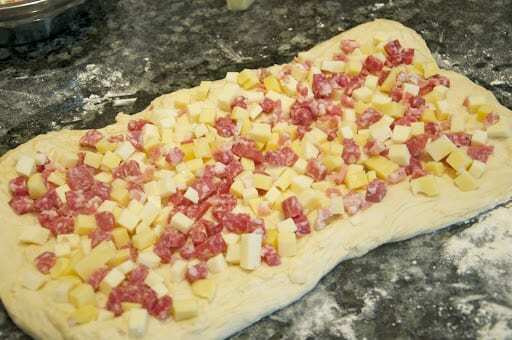 For this Easter’s casatiello, I used Emmenthal, provolone, salami and pancetta. If you don’t have a standing mixer, you can make the dough the old-fashioned way: make a fountain with the flour on a clean surface (ie, a mound of flour with a well in the middle, looking a bit like a volcano or a fountain). Add the dry ingredients in the middle, then water bit by bit, stirring with a fork or your hands to incorporate the flour from the sides of the well until you have a nice ball of dough. Then knead the ball with well-floured hands for about 10 minutes. Scoop the wet dough out of the mixing bowl onto a well-floured surface. 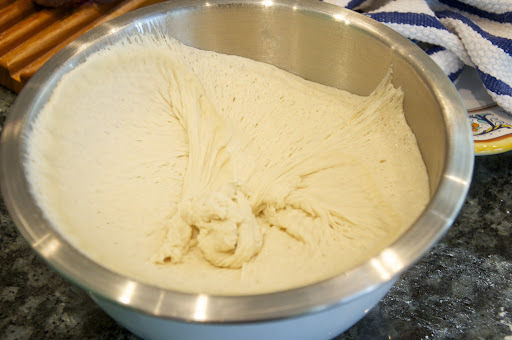 Using well-floured hands, form the dough into a smooth ball and place it into a greased bowl. Gently roll the rectangle up, as tightly as you can manage, into a long torpedo-like shape, curling it around. 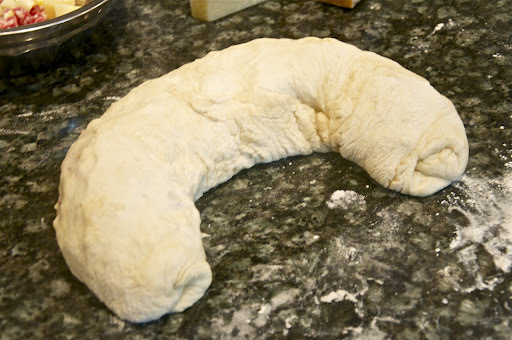 Now take the dough and place it gently into a large ring mold, bring the ends around and pinching them together. Cover the mold with a towel and let the dough rise again for another two hours or so, until it has doubled again. Mom makes it pretty much the same but with hard boiled eggs. She bakes it as you see it in your recipe before you put it in the the form mold in that curved loaf on a cookie sheet that’s been greased without letting the dough rise a second time. The result is a very crunchy, crusty variation that’s probably my favorite foods in the world! Capolavoro Frank! We all had our variations on this theme, but this particular version appeals to me quite a bit. The dough must be absolutely delicious, even without the cured meats. Thanks, Paula. And couldn’t agree more about the dough. What a festive bread! Looks gorgeous. I love lard — it’s got such a great flavor. Not easy to find good quality, but some butchers render their own. Fun post — thanks. And thank you for stopping by! Good lard is hard to find around here, too, unfortunately. There’s one purveyor at our local farmer’s market who will sell me some if I order ahead. Otherwise, online shopping, as it so often does, saves the day. Alarm set for tomorrow to make a surprise for the family ! Thank you and Buona Pasqua ! Made it ! Gone in a flash of light ! Thank you Frank ! I love the filling! So many delicious cheeses and salumi! Gorgeous. I had to find out your recipe for this! And yes, I’m going to save it and make it. I doubt if my parents had this since we were from northern Italy. But oh, what I’d give to see their eyes when they bit into it. Grazie per la ricetta. It’s a winner, Marisa Franca. I’m sure they would have loved it. And hope you do, too. Fantastic! Trust it tasted as good as it smelled… things usually do! Are the eggs in their shells on top hard boiled or raw? What is the significance of them being on top, especially still in their shells. 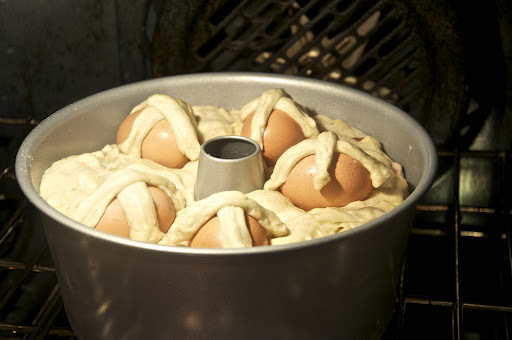 The eggs are placed raw but after an hour in the oven, they’ll be fully cooked. They are there for decoration, as eggs are, as you know, a symbol of re-birth. I lived in the Campania region for several years and always ate this bread on Easter. I live in the States again and would like to make this recipe this week. In Italy we always used fresh yeast (lievito di birra) but I cannot find any to buy at grocery stores here. Is the amount of yeast you call for in your recipe dried active yeast or fresh yeast? Thanks! The measurement is for dried yeast. As you say, fresh yeast is basically impossible to find Stateside! Happy Easter, Emily! Frank, check the first paragraph of the instructions for the dough. You forgot to say to add the yeast along with the flour, lard, salt/pepper, water. I almost screwed up because I follow your instructions to a T. Preparing this bread now for a family dinner on Sunday before the New Year. Have great holiday and thanks again for the great recipes. By the way, I wanted to comment on “anzogna.” I don’t know that word, but “‘a sugna” means pork fat, and in Avellino (and perhaps also nearby Apice? ), it can refer also to the rendered lard itself. (Lard in Italian is “strutto,” NOT “lardo.”) Can’t wait to make this recipe! But of course! Why didn’t I make the connection? Must be it. I’ve bought Casatiello the past 3 Easters at an Italian store near me. I have never been sure if one can eat the egg on top, though. Do you know if it is safe? Or any good? Sure, it’s perfectly safe. The egg is a little overcooked after an hour in the oven but fine to eat if you want. I’ve seen these cakes many times. If someone had told me I wouldn’t cringe at a recipe with lard in it just 2 years ago I would have not believed them. Now, thanks to great lard and ancient recipes, I’m a believer. It makes a great crust! I’ve even used suet for crusts and loved the result (grain fed good stuff — not what you put out for the birds). Lovely recipe and memories. Da Napoletana che sono I can tell you that this is a beautiful Casatiello ! Excellent job! Frank, you really DO have the greatest English-language blog in the world. (At least to me, and that’s all that matters!) My sincerest compliments. And Buona Pasqua! Oh, Leonardo, flattery will get you… everywhere. ;=) Buona Pasqua anche a te e ai tuoi cari! Semi-hard, dry cheeses are the norm, but you could try—just drain the cheese very well or you may wind up with some soggy bread on your hands! If you give it go, do let us know how it came out. Looks beautiful, Frank. I really like the eggs on the top. Hope you had a nice Easter. My father loves ciccioli. To be honest, I don't. My aunt made pizza coi ciccioli (and a bit of lard in the dough) and for my dad it was a feast. I actually use a bit of lard (which I made) in certain situations: it gives a special quality to the dough. You're welcome! Hope you do try it. Let us know how you like it. Please do! Hope you had a wonderful Easter. Looks delicious! And very nice, baking the eggs into it! I am thrilled to discover this bread; my dad is half Italian and anything Italian would make him happy; this bread would also make my mom (who is not Italian) happy! thanks!! Frank – I usually make pizza rustica, but a friend of mine from Salerno makes casatiello and I've always wanted to try it. Your version looks perfect. I'll check in again with you for the recipe next Easter. And I'll have to try crackling cornbread! Isn't it fascinating how many culinary ideas are common to cuisines that, on the surface, seem so different? Thanks, Claudia! Do let us know how you like it! Well, you're going to make me blush… but thank you! What a lovely thing to say. Thanks, Vicki! Had a great holiday. Hope you did too! With all this casatielli around the web, I want some too! such a wonderful Easter bread, very stunning Frank. the photo got my attention but crackling bread, oh my goodness, how I do love crackling cornbread. I have just this year learned of the Italian bread made with cracklings and would love to get my hands on it, you know I am not a bread (yeast) maker so I would entrust some one else to to the baking…. This is different than those we make. I want to save it (I also have an interest in trying something with lard as my grandmother did). It's so rich – begging to share the bounty of the new season. This is remarkable! Love the look of it alone. Will try this for a brunch soon. You have the most astounding site anywhere. It just keeps growing and expanding into an artform. Best from Jefferson's Table. This is beautiful and you prepared it prefectly. Funny how we all reminis of how things were when we were children during the holidays. I hope you had a Happy Easter!